We are going to store the frames of animation in a sprite sheet. 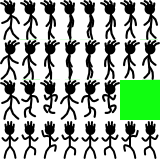 This is essentially a single bitmap which contains a number of smaller bitmaps in a grid where each bitmap is of fixed width and height and represents a single frame of animation (see Figure 1). We shall use the Simple2D Animation class to create time-stepped counters which automatically provide the current frame number to use in the animation based on the time elapsed, but if you don’t use Simple2D you can easily re-create this, or pilfer it from the Simple2D source code. playerXanim is a timer which returns a value from 0-7 (representing one of 8 frames of animation – in fact, the index in the sprite sheet to the correct sprite on the first or second row depending on the player’s direction of movement), repeating every 500ms (0.5 seconds). playerLadderAnim does exactly the same thing. The jump animation in playerJumpAnim is different. While we want the walking and ladder animations to repeat endlessly until the player stops moving, our jump animation has the player bringing his legs into the air for 3 frames when the jump starts. After this, we want to only show the final frame of the animation until the player lands. The timer created for playerJumpAnim essentially works the same as the other two, except that it returns a value (frame index) from 0-2 over the course of the first 200ms from when the animation begins, and after that always returns 2, because it is clamped at its highest value. Remember that although I’ve written things like ‘starts from the first frame’, the Animation class itself does not handle animation; it simply returns a frame index into the sprite sheet based on the amount of elapsed time and the settings specified when the instance of Animation was created. Later we’ll use the function Animation::GetAnimOffset() to retrieve the frame index from each instance of the object. So for example with playerXanim, if you call Reset(), then GetAnimOffset() will return 0 for 500/8 ms, then 1 for the next 500/8 ms and so on. It is our job to take that number, find the correct portion of the sprite sheet and do the rendering. We’re going to need to know the movement vector of the player this frame, before it is updated by the player potentially pressing movement keys. This is so we can compare it with the movement vector after player keyboard input has been processed to determine if we have just started moving in a particular direction, and therefore, whether to trigger a new animation and which one. The bulk of the update work is done right at the end of UpdateObjects(), before the player death flag is checked. Let’s step through it one item at a time. Crucially, the direction the player is facing is only updated when walking left or right. When still, the variable is not changed, leaving the player facing the same way as they were walking before they stopped. As shown in the comments, the code merely pauses the animation when the player is not moving up or down, and if they have just started moving up or down, unpauses it. Note how unpause instead of reset is used here: when the player stops moving vertically, the most recently used frame of climbing animation is shown, so for example if the player’s right arm was grabbing the rung above him, he will still be doing this when stopped. When he continues climbing, the animation runs from where it left off, for the most natural-looking effect. At this point, our frame counters all have the correct values to point at the right frames of animation each frame depending what the player is doing. Now we have to select the appropriate sprites and render them. In short, the first 4 arguments specify where to draw the player on the screen and its width and height. These arguments will always be the same: the location of the player, and the width and height of a single player sprite, which in our game is 20×40. The next 4 arguments determine which portion of the sprite sheet stored in player to use. Once again the first two of these arguments specify the top-left co-ordinate to use in the sprite sheet, and the last two specify the width and height, which as you see is the same as the player width and height (20×40) as you would expect. Recall that floor(playerJumpAnim.GetAnimOffset()) will return a frame number from 0-2 depending how many milliseconds we are into the jump (0 from 0-99ms, 1 from 100-199ms, and 2 from 200ms onwards), and that each column on the sprite sheet is 20 pixels (one player width) wide. Multiplying the frame counter by 20 gives us a starting left-hand X pixel on the sprite sheet of either 0, 20 or 40, which is what we want for a left-hand jump. Recall also that frames 0-2 on the 3rd row are for jumps to the left, and frames 3-5 are for jumps to the right. 3 frames of animation are 3 player widths or 60 pixels wide, therefore if we are facing to the right, we add 60 to the left-hand X pixel to use, giving values of either 60, 80 or 100 for the right-hand jump animation. Next, recall that all the jumping animations appear on the 3rd row of the sprite sheet and that each row is 40 pixels (one player height) tall. Therefore, the Y co-ordinate of the top-left corner to use in the sprite sheet will always be 80, indicating the top pixel row of the 3rd row of sprites. Armed with this mathematical information, we can see that the call to DrawPartWH() always selects the correct jump animation frame depending on the time elapsed and direction the player is facing. First we check to see if we are on a ladder. To do this, we must be standing on a platform, it must have a surface type of Ladder and either the top, left or right of the player must be touching it as well as the bottom of the player. This last check is crucial, otherwise when standing on top of a ladder, since we are still considered to be inside it, the climbing animation would be displayed when we really want the normal ‘standing still’ image. As you can see the first 4 arguments are – as expected – the same as for the jump animation. This time we select a frame from the 4th row (120 pixels down from the top of the sprite sheet). Once again the first 4 arguments are the same as before. The 6th argument is of interest here, selecting the top Y pixel from the sprite sheet as either 40 if moving right (the 2nd row), or 0 if moving left (the 1st row). At the moment our player’s legs move at the same speed in the fixed-time walking animation regardless of how fast the player is actually walking. This may look pretty weird (some might say oldskool!) on our slippery ice and sticky treacle platforms. While this type of animation is perfectly fine, with a smidgen of maths we can easily make the player animate relative to his or her actual movement speed. // This sets the speed of the player's walking animation according to how fast he/she is moving. // The faster the player's movement, the smaller the repeat interval of the animation. // interval and therefore puts us earlier in the animation. The crux of the problem is solved by the middle line of code. All we do is change the interval (how many milliseconds the animation takes to complete and start repeating) so that the faster we are moving, the shorter the interval is, and therefore the quicker we will get through each frame of animation as each will be on-screen for less time. I chose the value of 150000 somewhat arbitrarily; use trial and error until you like the way it looks: higher values slow down the animation, smaller ones speed it up. The first and third lines are to fix an issue with what happens when the player starts to decelerate. As the player’s speed decreases, the animation’s total time becomes longer, however our absolute time position into the animation remains the same. Imagine that an 8-frame animation is 800ms long and we are 650ms into it – this would put us on frame 6 (counting from 0-7). Now imagine that the player slows down and the animation interval doubles to 1600ms – but we are still only 650ms into it. We are now on frame 3. Since the player tends to decelerate quickly, this leads to a bizarre effect on the screen of a series of incorrect frames being displayed in rapid succession in a backwards animation as the total animation time grows exponentially. To rectify this issue, the first line of code above first retrieves from the Animation class exactly how far (in percentage and fractional percentage) into the animation we are. The animation time is then changed, and we then set our position in the animation to the same (relatively speaking) as it was before, ie. the same percentage. This ensures we stay on the same frame we were on before and at the same relative position in the animation. And that’s all there is to it. Animations for climbing ropes, swimming in water (hint: you will need to widen the player sprite and change the collision points) and such will work largely on the same principles as the animation types demonstrated here. A link to the full source code and pre-compiled EXE can be found at the top of the article. In Part 8, we will look at implementing pass-through platforms, where the player can jump up through them from underneath, but they are solid (and the player does not fall through them) on top. Until next time! Am I aloud to use this in my own video game I am designing for free (no copyright and royalty free)?? ?